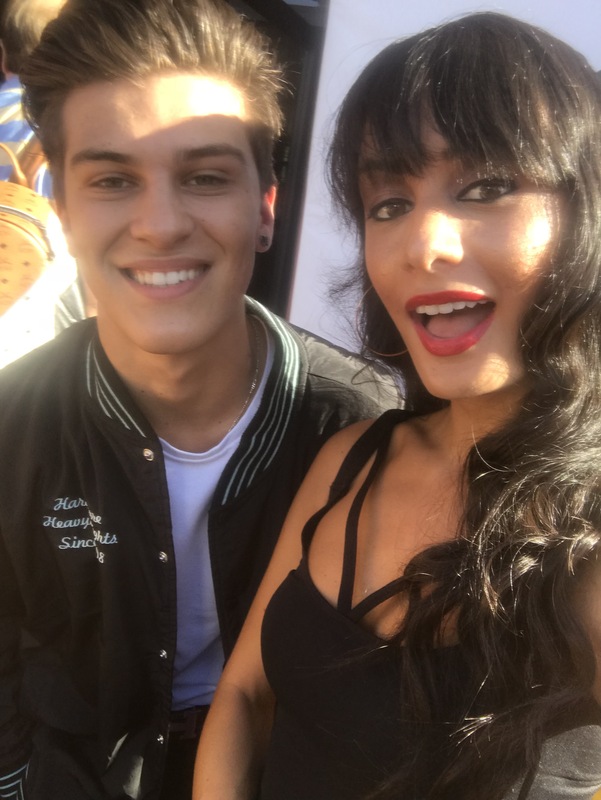 VIPAccessEXCLUSIVE: Sean Cavaliere Interview With Alexisjoyvipaccess At The “Chicken Girls: The Movie” Premiere! Sean Cavaliere is the definition of one multi-talented individual! A phenomenal singer and a brilliant actor – what could get better than that?! Sean Cavaliere is known for being one outstanding musician. His incredible and awe-inspiring vocals are truly unrivaled and everything that he works on always turns out to be absolutely extraordinary. The stage is a second home for the remarkable Sean Cavaliere and any and every performance that he gives always mesmerizes everyone. In fact, Sean Cavaliere recently amazed everyone with his effortless, singing talent as he performed on the hit FOX show, The Four. The awesome Sean Cavaliere is definitely someone who stands out in the industry. He has a lot of exciting projects to share with all of his fans including some brand new music we all have been eagerly waiting for. We know that Sean Cavaliere will blow us all away with his sensational music that we will be listening to on constant repeat. Sean Cavaliere has another thrilling project to share with everyone – he has joined the cast of digital network Brat’s hit show, Chicken Girls and is set to star in season three of the show. Sean Cavaliere is spectacular and we always enjoy keeping up with him and all of his stellar projects. I, Alexisjoyvipaccess had a great time covering the premiere of Chicken Girls: The Movie and had a fantastic time catching up with and interviewing the charming Sean Cavaliere again at the event. Sean Cavaliere dished exclusively to Alexisjoyvipaccess all about his new music, working on Chicken Girls season three and so much more only in our VIPAccessEXCLUSIVE updated interview. Sean Cavaliere even spilled on which musician he would like to swap lives with for a day – hear what he had to say in our VIPAccessEXCLUSIVE updated interview below. Thanks for another fun interview, Sean! Check out my VIPAccessEXCLUSIVE updated interview with the magnificent Sean Cavaliere at the premiere of Chicken Girls: The Movie below. Be sure to watch Chicken Girls: The Movie out now on Brat! Previous Article: Nickelodeon Has A Lot Of Excitement In Store At The 2018 San Diego Comic Con – Check Out Nickelodeon’s Panels And Activities Here! Next VIPAccessEXCLUSIVE: Nia Sioux Interview With Alexisjoyvipaccess At The “Chicken Girls: The Movie” Premiere!